Asparagus has been a good price in our stores lately. We found the best way to cook it in our test kitchen - flavorful, easy, fast, not messy! 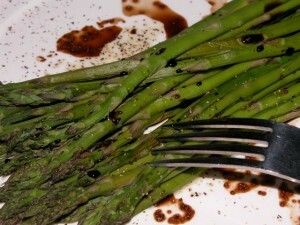 Break the asparagus off roughly 2/3 from the tips - discarding the stems. Rinse in cold water. Place on a toaster oven tray. Toast on medium or until crisp tender, about 3 minutes. Serve with a sprinkle of fresh cracked black pepper and balsamic vinegar.